"2:30pm on Thursday, April 16. We waited only 5 minutes for her to come in the room. To tell us again they only tested 71 genes, to tell us Sonya's positive result was on CDKL5. To tell us that with that positive result on this gene and her clinical presentation of seizures, she would most likely have: epileptic encephalopathy early infantile 2, x-linked infantile spasm syndrome, and or Atypical Retts Syndrome. We asked our questions, I left there with some odd reassurance that just because she had a mutation with her CDKL5 gene did not mean she would have any of the ugly possible disorders assigned to the gene. 4 years have passed since we were given an answer. An answer that over the years has been used and honestly overly abused to explain why she has seizures, why her stomach doesn't work, why she requires feeds directly into her bloodstream, why her eyes make wonky movements, why she has cortical vision impairment, why she does not sit, why she does not talk, why she does not have functional use of her hands, why she has low tone, why she cannot run outside and play with her siblings, why she does not interact with others in a typical fashion, why she has poor bone mineralization, why she is failure to thrive, and why one day I will have to bury my daughter. 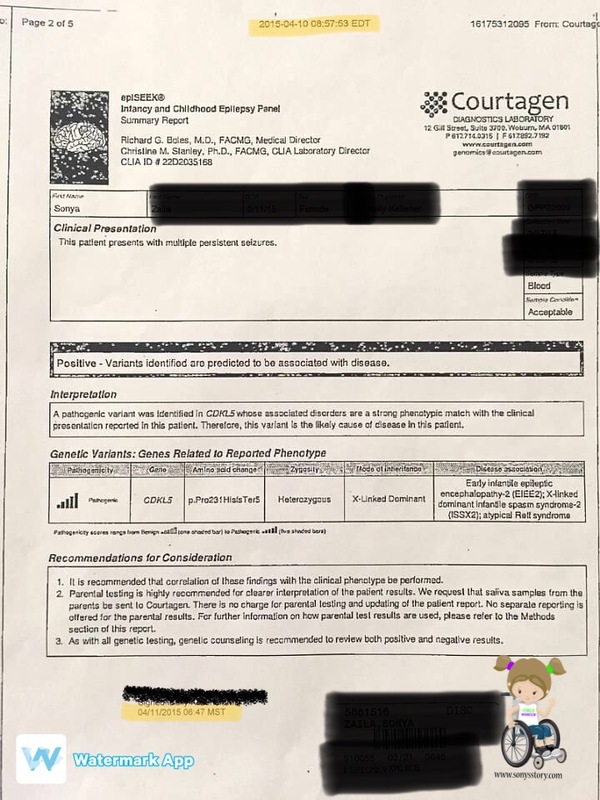 I wish the diagnosis had explained why it had to be her, the best way to treat all of the problems it has brought into her life, and at the very least given her a voice to let us know if she agrees with our management decisions, how the medications make her feel, if we truly are giving her a better quality of life, if the procedures have been worth it, and if she wants us to keep doing what we are doing. I have found myself wondering over these past 4 years, what good has knowing the cause actually done for her? We dove right in thinking knowing when she was 8 weeks old would actually make a difference for her. We clung to the (few) children we saw crawling, walking, and saying words, whose parents said that intensive therapy is what made the difference. I convinced myself that Sonzee was young enough, surely she could beat the odds. Except over these past 4 years, I have learned that no amount of intensive therapies, money, will power or determination can compete with her specific mutation. It's helped our family cope, but it hasn't healed our hearts. While we have spent 4 years gaining an extended family that stretches around the entire world, we have mourned the loss of TOO MANY siblings. We have spent 4 years knowing that there is no cure, that there is no specific medication or treatment that can replace her mutated CDKL5 gene, that there is no way to stop her intractable epilepsy, and that there is absolutely nothing we can do to ease any of this for her. We have spent 4 years clinging to hope of what I am not even exactly sure, but I suppose hope that all of this will change? Of all the answers that we were given on April 16, 2015, I wish one of them had been, the results of the infant and child epilepsy panel did not yield any results. It was a Wednesday. I cannot remember the exact time, but I remember walking around the house while on the phone picking up toys and putting things away. I can tell you what rooms I was walking in and out of and where I was when the neurologist said the words, "we got results back from her genetic testing, but I don't want to tell you what they are over the phone. I don't want you to look it up, and think that will be Sonya". I remember when I hung up the phone I felt relief. I was actually giddy with excitement because we had an answer. We would never have to wonder why she was having seizures. I quickly learned on this journey that everyone processes things at their own rate and in different ways. When I told Sam that we were meeting the next day because she didn't want to tell us the results over the phone I didn't quite know what he was thinking. It wasn't until a little later that day when he called me from a gas station that I got a glimpse into his mind. "Randi, it isn't good", was what he said when I answered the phone. I was not even sure what he was talking about, but he continued on to say, "I looked up the panel, and there is only one good thing, and she doesn't have it". I said, "Sam, you don't even know what you are looking up, it is going to be fine, we will have our answer tomorrow, stop looking things up." I honestly was so content with knowing we had an answer it never dawned on me to even look up the panel. Not once during the 3 weeks since that test was sent off did I even consider what was actually being tested. I guess I was not always as neurotic, worried, or as pessimistic as I have become. When I think about that fact, I realize how much I have changed in 4 years. 4 years ago today even though I knew we had an answer, I still had no idea what that answer was going to lead to and what was going to be in store for our family. 4 years ago today, we were a little on edge, but still BLISSFULLY unaware of all the pain, all the surprises, all of everything that the characters CDKL5 was going to bring into our lives, and a lot of the time, I wish I could back. On March 17, 2015 during her first PEMU stay we agreed to send off lab work for genetic testing. When the neurologist brought up the suggestion stating it was to rule out genetic causes of epilepsy, I shrugged my shoulders in a cocky manner because Sam and I had genetic testing done through a reproductive endocrinologist prior to any pregnancy, and everything as far as genetic compatibility went, checked out great. Of course, in my mind, Sonzee didn't have anything genetic, how could she? On March 26, 2015, the lab received her sample and began to compare her genetics to that of 187 genes associated with causes of epilepsy. Life for us carried on, but oh, how naive I truly was. 4 years ago yesterday the report was sent to the hospitalist at Phoenix Children's Hospital. Theoretically, her fate was sealed with that fax, but really it was always present; before I even knew I was pregnant, the entire 9 months I carried her, and for those first few weeks of her life during every questionable movement that was attributed to "baby's do weird things". Who would have even considered a genetic mutation for epilepsy? Who knew such a thing existed, especially with no family history? I honestly didn't even think about the potential positive result phone call, thinking back I don't even remember thinking about the tests after they were sent off. While there was "no reason" for her epilepsy, that was "okay", it meant she could grow out of it, and that's what we wanted, that's what we hoped for, but that is not what we got. 4 years ago today, the hospitalist who sent for the testing electronically signed that she received this document. I wonder if she had even heard of CDKL5 before this was placed on her desk. I know when her neurologist at that time received the result she had not. We remained blissfully unaware of what was sitting less than 5 miles away for another 4 days until her neurologist called to let me know she received results. I wish I could remember life before seizures, before hospitalizations, before real worries and fears, before life with CDKL5 became our world and our normal. I wish I could remember what I was like as a parent before our lives became consumed with all things CDKL5, before my naivety of the medical world was stolen from me, and essentially before her fate was signed, sealed, and delivered on a faxed piece of 8 x 11 paper to a doctor we hardly knew. I thought possibly as time went on that I would get over it, maybe even get used to it, or that it would become easier. It didn't, it hasn't, and I realize it won't. At 9am this morning I had already given Sonzee a loading dose of Keppra and while that broke the cluster of spasms she had been having for 20 minutes, an hour and a half later she had another 11-minute seizure. This is just part of the severe form of intractable epilepsy that comes with CDKL5. I sometimes wonder what good it is to have received her CDKL5 diagnosis when all it is did was bring us a reason as to why she was having seizures, but no solution on how to make it end. 11 days now remain until the anniversary of diagnosis day, yet not a day has gone by since the official day that I don't have some type of flashback or vivid memory of that specific day. I suppose the day doesn't even need to be acknowledged on its own because we live the representation of CDKL5 every single day. For some reason, though I cannot get over the significance of that day. I have the quote "what a difference a day makes" written above significant happier dates our family has experienced and inside a frame in the playroom. I wonder about the difference we would be experiencing had April 16, 2015 not lead us to the knowledge of CDKL5. On Saturday night Sonzee had one of her typical 15-minute seizures. Her oldest sister sat down next to her completely unprompted and began stroking her head. When I got the seizure tracker app open the video being captured was just so sweet that for a split second I could almost forget the reason behind the comforting. I was not really thinking about much at the time besides that I needed to finish getting Sonzee's TPN ready, and then the silence was broken by an innocent 9-year-old asking if one of Sonzee's CDKL5 siblings walks. For the next 13 min and 59 seconds, my oldest continued to ask about the skillset of this other CDKL5 child and then spoke about another CDKL5 sibling who had passed who would have been her age and in her grade. During the entire conversational exchange, she rubbed Sonzee's arm, her head, and was talking to her. At one point she explained to Sonzee that she has seizures at the worst time because she made her siblings late to school last week. From one perspective it was as if she was just chatting with her sister over breakfast, yet the reality was that her sister was actively seizing. I sent the video to the mom of one of the children my oldest was referring to during the conversation and she replied "okay I am going to ignore the fact that the video is actually of a long seizure and tell you that it is good...[oldest sister] is too too aware though, it really breaks your heart". As we continue with 13 days remaining until Sonzee's diagnosis day anniversary, it is even more striking to me how much a diagnosis of CDKL5 effects not just the child, but the entire family. April 16, 2015, was not just the beginning of Sonya's Story, it really was the start of a new chapter for every single member of our family that forever changed, and in some cases completely reshaped and shifted the trajectory for each of our individual lives. While I know the positive traits our children are likely to gain because of such a diagnosis, a lot of the experiences they have to endure continuously break my heart. We got home from a wedding not too long ago and everyone dropped like flies right into bed after their showers. That is everyone but me. Sonzee needed her food refilled and her TPN started, so after I took care of that I came to my computer and thought about writing a blog post. I was clicking through the years tab on the side of my screen to see how many posts I wrote in March over the years since I began blogging and then it dawned on me that in 30 minutes it will become April. My heart skipped a beat at this realization and that pesky weight in my chest that I manage to push aside resurfaced. It means in just 15 days it will have been 4 years since we first heard about CDKL5. Diagnosis Day, is probably one of my least favorite days of the year. It is one of those anniversaries that I feel requires celebration, but yet it is a day I feel should never be honored. Such a mixed bag of emotions. I often wonder how it becomes April so quickly each year. As if 365 days manage to literally speed by just to reach April 16. It is one of those days like the birth of a child or Kindergarten graduation that you remember every detail as if it just happened yesterday. A profound day in Sonzee's journey as well as our lives that gave us answers and a weird sense of closure yet at the same time an introduction into a world full of uncertainty, fear, and heartache that we had no idea existed. 4 years ago we had no idea about the world that would soon be introduced to us. A world that was existing concurrently but yet completely oblivious to our family. A world where children were dealing with challenges we would never have even considered children would be forced to live with. And a world where parents were making decisions that no parent should ever have to consider. A world that I never dreamed existed because you don't even consider this sort of world will reveal itself to you or your family. I think about the 4 years that have gone by and I cannot even imagine what life was like without our knowledge of CDKL5. Just 4 years ago we were strangers to the world we now only know as our world. A world that once spoke a foreign language but yet is now the only language we understand. A world that we couldn't comprehend and we weren't sure where we quite fit in, but yet the only world we now feel comfortable and understood. A world where the bonds we make with others on the same or similar journey will far surpass those that could ever be created between those who can't imagine. Prior to April 16, 2015, I couldn't imagine, rather didn't want to imagine what CDKL5 was, or how a parent could parent a child diagnosed with something as challenging and horrific. Yet, here I am, and here we are just 15 days away from the day that changed our lives forever. While I feel grateful we didn't have to wait long to get our answer, I am still just as devastated, just as clueless, and just as broken as I was sitting in the car reading the list of items Sonzee most probably wouldn't do in her lifetime, because sadly...for us...for her...it was all true.